Didge wondering if amnesia can be faked. Steve debating if Nicola has amnesia after seeing her smirk. Rachel looking for Angus' ring that she's lost. Ty finding Rachel's ring, misshapen, in his boot. Declan enters #32 to persuade Ty to have a party since Libby and Steph are away, that is after Ty reminded him he lived in #24! Ty asks Declan for advice (without mentioning names) over his dilemma after finding Rachel's ring in his car and Declan's advice is to keep quiet and “hide the ring where Rachel were never find it because the last thing she needs right now is more bad Angus mojo”. 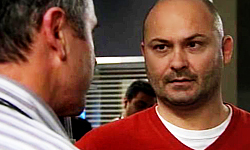 Steve asks Karl questions about amnesia and after answering them, he adds that given the nature of Nicola's injuries she's a prime candidate for PTSD when Steve mentions his idea that Nicola is faking it. Karl also adds that putting pressure on her may make things worse. Toadie and Callum are showing Nicola pics to try and jog her memory although Callum tries to embellish that things were more advanced between herself and Toadie than is actually the case. Rachel rehearses ‘Invincible' with Ty but she isn't exactly giving it 100% so Ty stops to find out what's wrong – nothing, she's just needs a break, but they press on. Didge and Steve work out that they both think Nicola is faking it but he tells her to keep quiet it in front of Miranda. So when she talks to Miranda, she tries a different tact – that Steve isn't really happy at having Nicola stay and suggests Nicola moves to Sydney to be with her mum especially as she and Steve have just got their relationship back on track. Miranda is having none of it thought although Didge's words seem to strike accord. Karl and Susan are talking about Nicola when they spot Miranda getting ready to leave. Susan asks Karl to take the shopping inside so she can talk to Miranda. Miranda admits she is having doubts after Didge's chat whether she wants Nicola home or not after as Susan recalled wanting to be with people she knew when she too had her amnesia. After a bad rendition of ‘Unforgettable', Ty calls a halt to the rehearsal and eventually his conscience gets the better of him (plus Rachel had picked up he wasn't exactly on top form either) and shows her what is in his pocket – Angus' ring. He reassures her that he didn't hide it from her on purpose or that he is glad it was broken although he then bemuses Rachel by having a conversation with himself analysing whether he's stalked her again. Ty tells Declan as they play pool that it's his fault for him returning the ring to Rachel and getting all bemused over it. 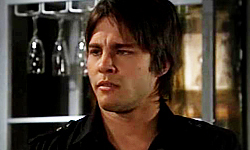 Declan tells him that Rachel saying nothing when he returned it was a bad sign. Rachel eventually reacts over Ty returning the ring when Didge tries to get her to talk about it. “Besides, he's the one who over-analyses everything. He's he crazy person.” Rachel tells her. Ty wonders how Rachel managed to get him acting like a crazy person! “She's got mad skills” replies Declan before adding that he talked about his feelings which a guy must never do. Didge tells her that Ty debated returning the ring because he likes her. “The easiest thing would have been to chuck it away,” she adds. “I blew it” is Ty's summing up of the situation and Declan doesn't dish out the sympathy, instead agreeing that he stuffed it up. “But you do like him right?” asks Didge, which Rachel agrees with but adds that she doesn't want to lose Ty as a friend. She rejects Didge's suggestion that she is scared but Didge follows up by telling her that she is using Angus as an excuse. “She's probably bawling her eyes out over that ugly thing right now” is Declan's view and he does an impression of Rachel telling Angus she loves him. Didge reassures Rachel that she is doing the right thing – that Angus should be left in the past. “I already have” replies Rachel. So while Rachel is getting excited at the prospect of dating Ty, he's admitting defeat – “no more Rachel Kinski”. Steve brings Nicola some magazines from the clinic and subtly suggests that she'll get more emotional support from her mum. Nicola is very hesitant and Steve puts a very positive spin on things – that she and her mum get on brilliantly even running up big phone bills since she's moved to Melbourne and gets out his phone to set it all up even suggesting booking a flight! You can see Nicola wants to say something but is scared to put her foot in it. Miranda arrives to see Nicola and immediately notices that she is down. Nicola pleads not to be sent back to Sydney after Steve said she should return there to repair things with her mum. The tears are and added bonus and it works – Miranda tells her she is going nowhere and will deal with Steve. Steve and Miranda argue over Nicola and he points out that she did lie because she twisted around what he said to her in their talk. Miranda wonders if the reason he doesn't want Nicola back is because their marriage won't be able to survive, which he denies. MIRANDA: If the only way you and I can be happy is to get rid of her then we're not okay, this marriage is not okay. Rachel arrives to see Ty to invite him to the mystery gig Steph has lined up in Charlie's but he knocks her back because he doesn't fancy going back to work and shuts the door in her face… twice! After the 2nd time, she tells him to meet her at Charlie's at 9pm because nobody closes the door on her! The teens and random extra teens stand in a queue waiting getting into Charlie's. Didge is ecstatic, unlike Declan and Rachel, to find out that its The Veronica's Steph as lined up for Charlie's. Didge reassures Rachel that Ty will be there. Didge tells Declan to get Zeke and Ringo to the bar because Rachel is the 3rd wheel even though she denies it. 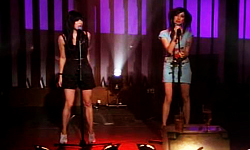 Eventually The Veronica's come on and perform their new song – "This love". Ty appears and Rachel smiles at least! Nicola awakes to find Steve at her bedside. He pleads with her to go back to Sydney because he is sure that Miranda knows how he feels about her. Nicola leans in to kiss him and falls straight into his trap his only regret that there wasn't a camera set up to provide proof and end her charade. Nicola then turns violent, lashing out at Steve and tell him that she hates him which only stops when Karl, a nurse and Miranda rush into the room. “What have you done to her?” Miranda asks. Gig over, Ty and Rachel leave the bar and apologise to each other… and end up pashing with each other even though Rachel admitted her head was all over the place and he'd wait for her.